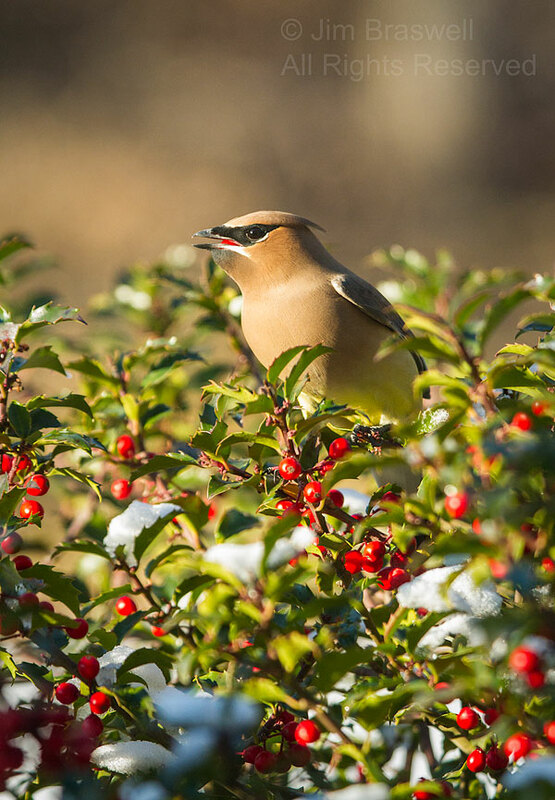 As winter begins to wind down, I'm going to feature a special shrub I have in my front yard ... a bird magnet for wintering birds here in Missouri. 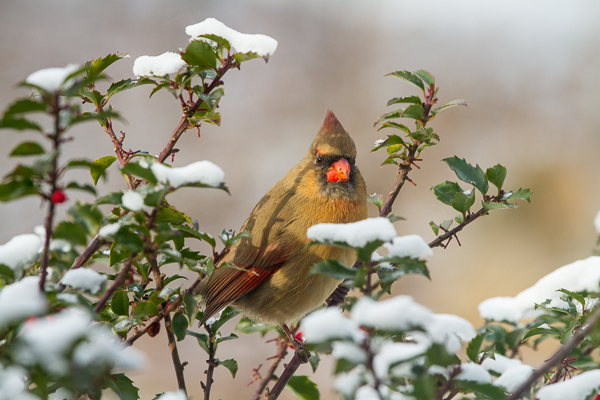 This magical bush has been a great source for bird photography this winter. And what is this bird magnet? 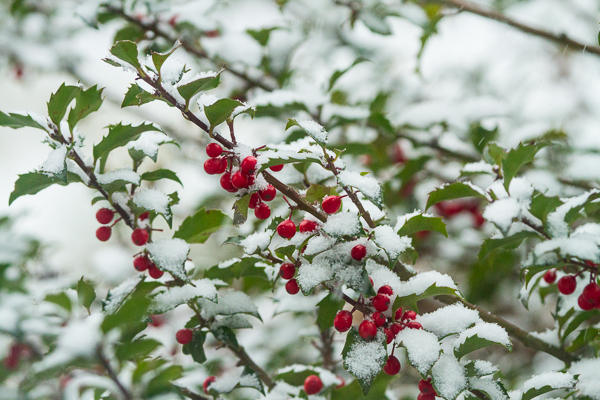 It is a holly bush. 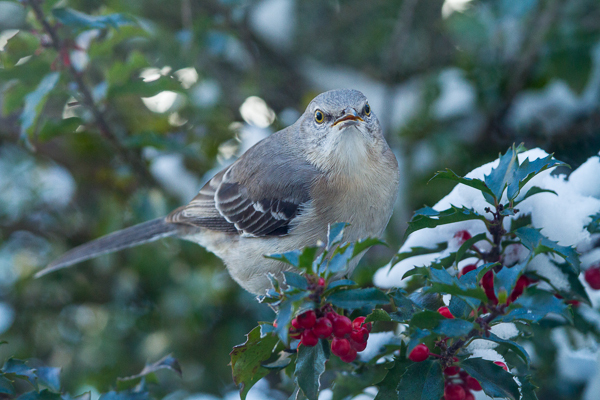 And starting this winter, I have had the joy of photographing several other species that are now challenging the Northern Mockingbird for the berries. 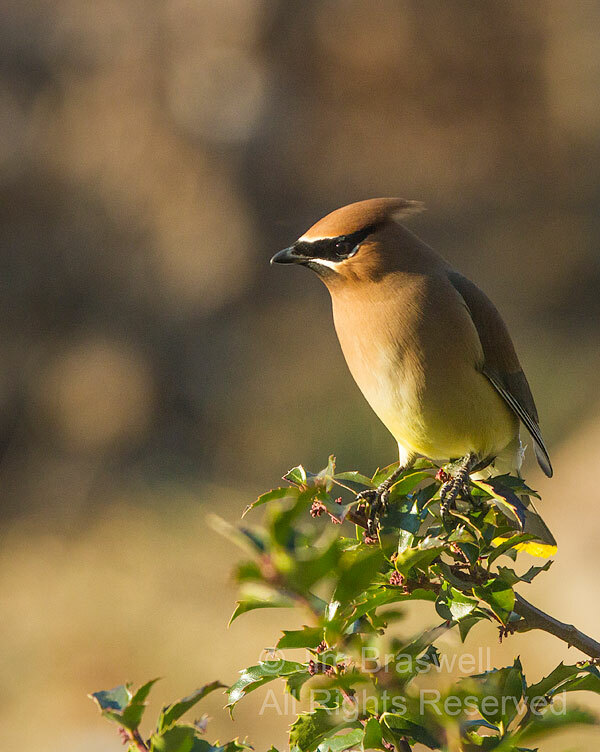 My most prized visitors this winter were a group of 6 Cedar Waxwings (Bombycilla cedrorum). 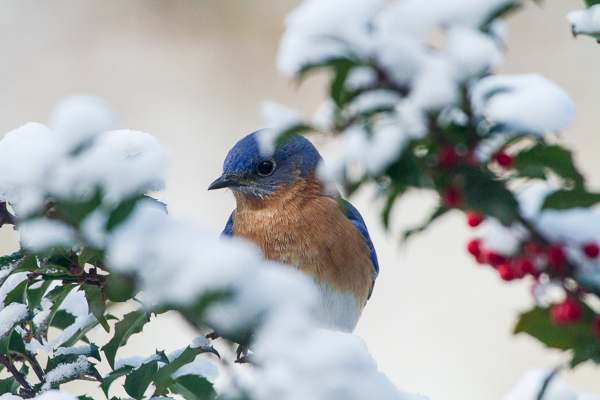 Always a beautiful bird, but oh so majestic in the snowy hollies! The next visitor? 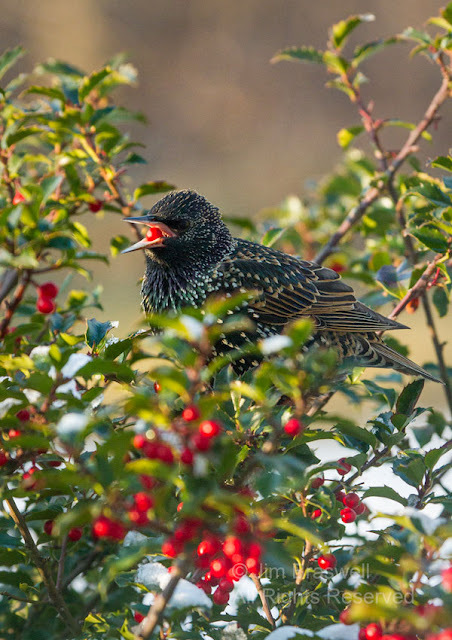 A European Starling (Sturnus vulgaris). 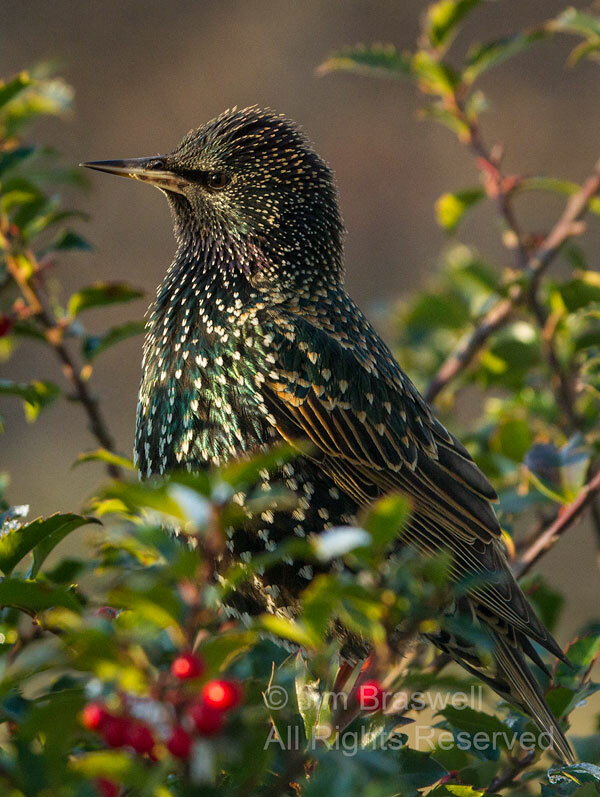 When these birds are captured in good lighting, the purple and green gloss really shines through the black coloration! 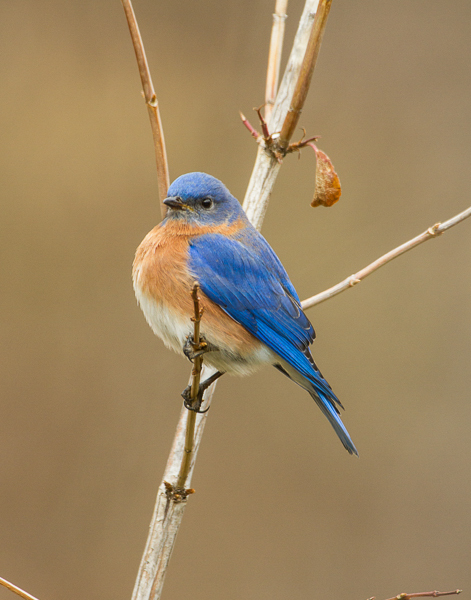 I also had a few Eastern Bluebirds (Sialia sialis), which is our (Missouri's) state bird. 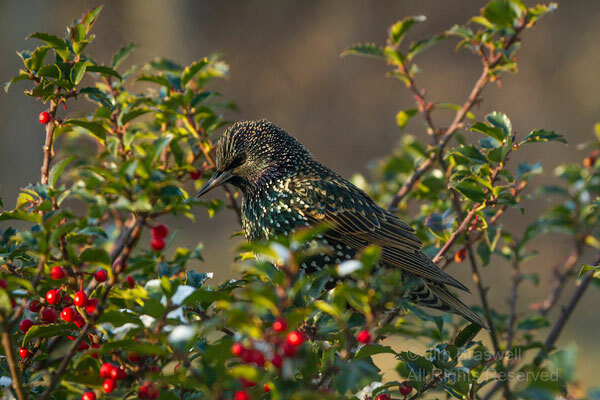 They have been one of the most skittish of the birds visiting the holly bushes, so I only have a few images of these beauties. 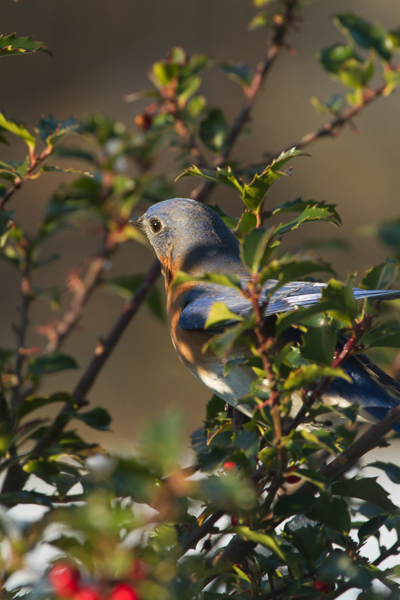 And this next image of the bluebird, one of my favorites, was not on the holly bush, but was waiting in a nearby tree, till the holly bush was a bit less congested with bird activity! 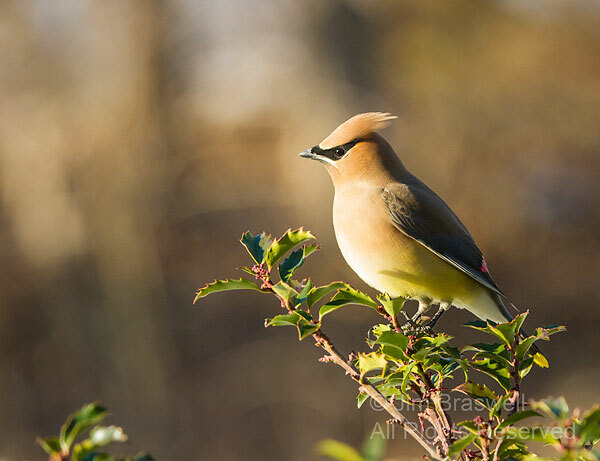 And this next image was shot early in January. 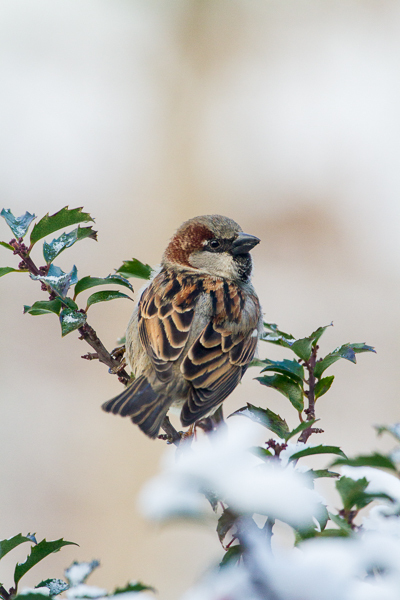 Apparently, our up-and-down temperatures this winter have created a confusion in our birds ... this female House Sparrow showed up with a twig ... isn't it a bit early to start nesting! In conclusion, if you are doing some landscaping and need a good bird attractant, consider using one my bird magnets, the Holly! 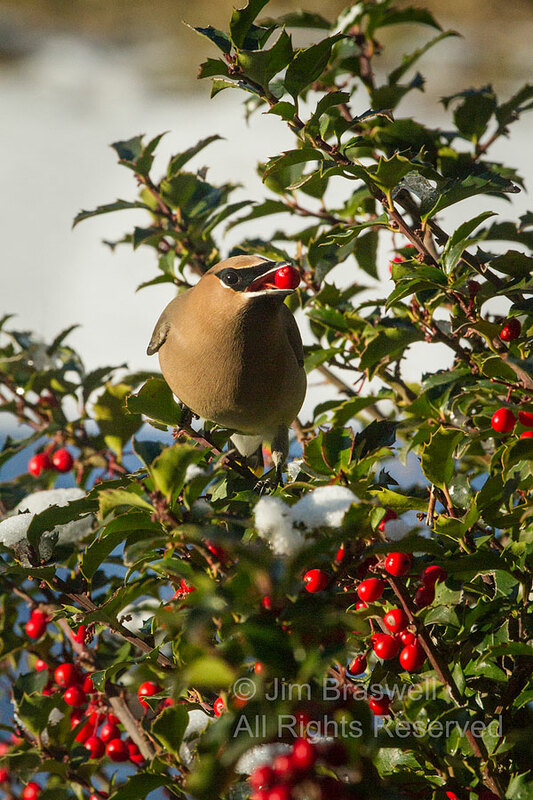 And if you want to make the best of everything, plant it in front of a window and bird all winter, from the comfort of your own home ... I did and it sure is nice! 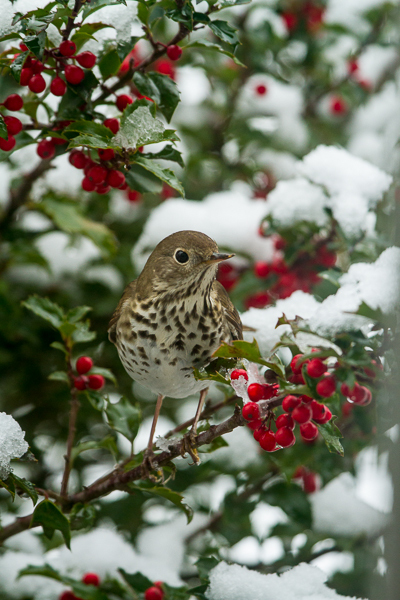 Hermit Thrush, not Wood Thrush. Thanks for the ID help, Carrie, much appreciated! 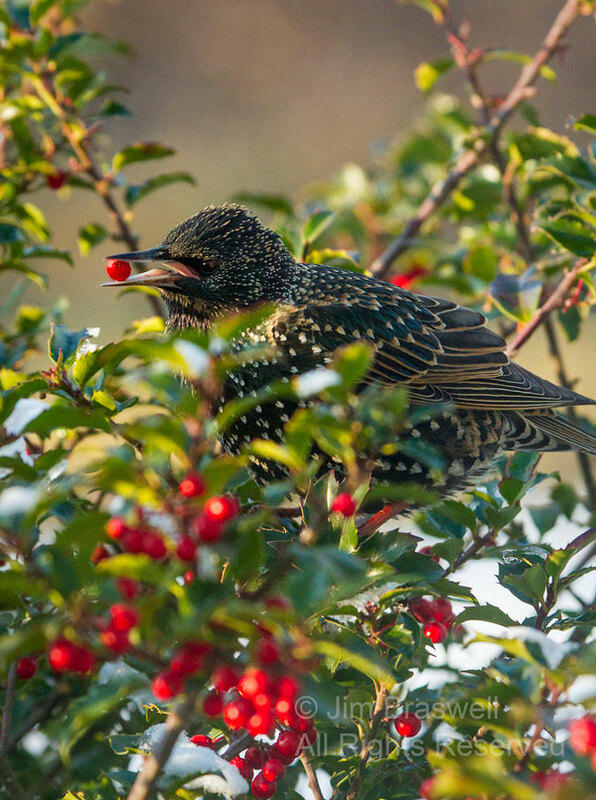 Thanks for your insight into the Holly bush and it's bird attraction qualities Jim. 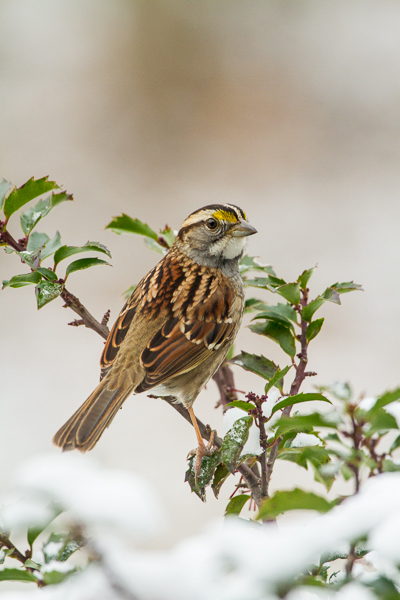 Especially with all the great bird photos to go with it! I agree with Carrie on your Hermit Thrush. Can you elaborate on the species of Holly you chose? 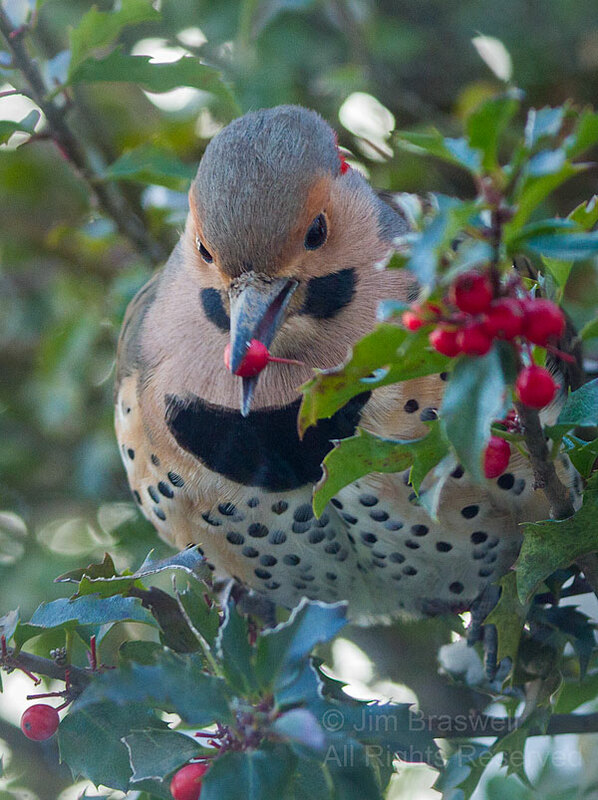 I am getting ready to do some more bird friendly species plantings and live in zone 7 in California. Any recommendations? Thank you for the kind comments and the ID assistance, Larry! It's been quite a while since I planted my hollies. Not positive, but I think I planted a species called "China Girl" (female plant) and an equivalent male plant. Sorry I can't be more specific. I've tried to find the original tags, but unable to locate them. I'd suggest contacting a local nursery (who will sell only plants adapted to your environment) and see what varieties they have. 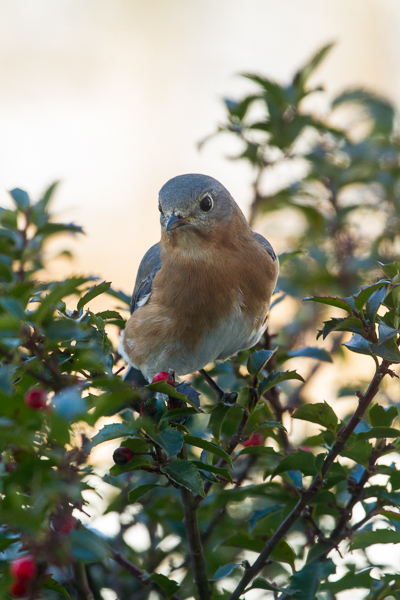 Be sure to ask for a variety that produces the berries ... a must for birdwatching! 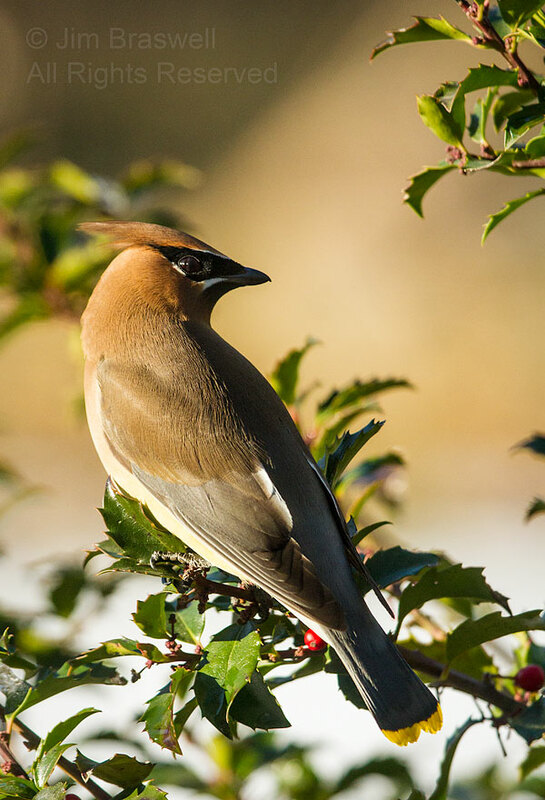 You'll also need to plant the bushes in a shady to mostly-shady location. Then, sit back and enjoy the magnetism! NIce work Jim, these birds all get to have a Holly jolly Christmas thanks to you, and great shots too! 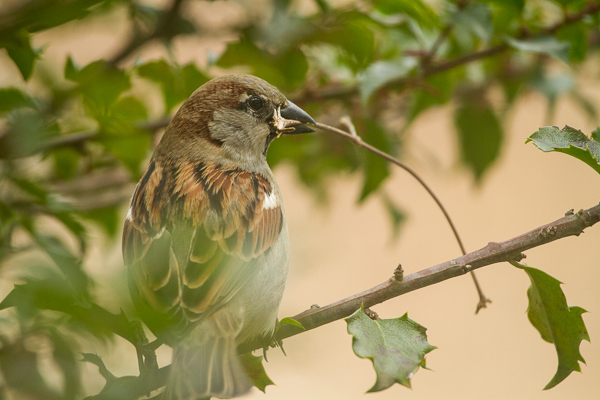 Your twig-bearing House Sparrow is missing the pale eye stripe charicteristic of females; males that aren't in breeding plumage are sneaky! Thank you for the kind comment, Hilke! Wow! What a beautiful bunch! Great post, Jim! 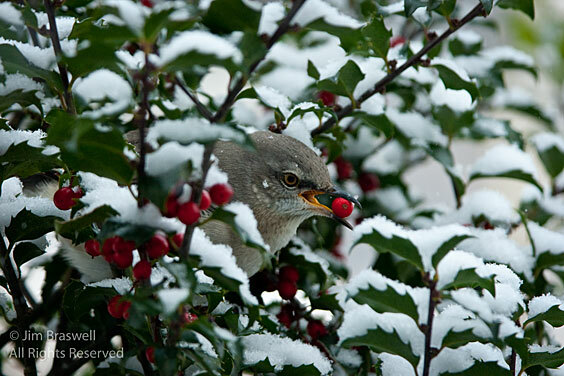 Oh my goodness ... so many beautiful birds are attracted to your holly bushes! I just wrote a note to include holly bushes when we start landscaping around out new house. 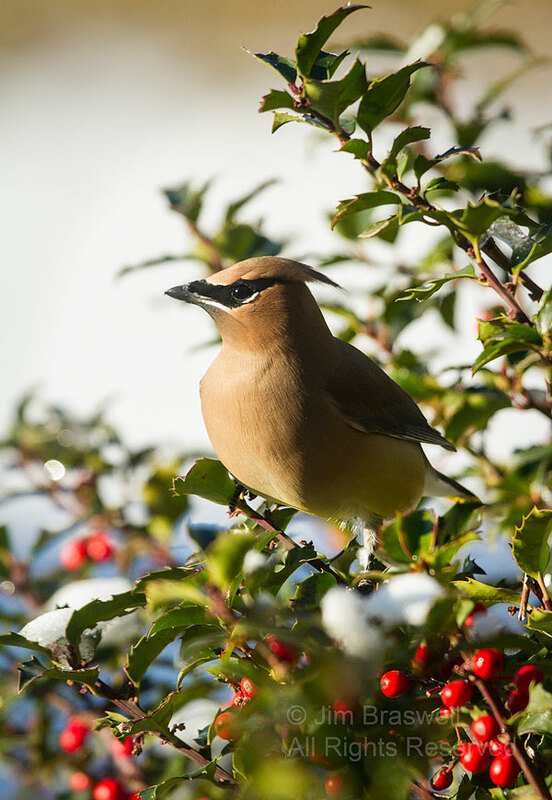 What a joy it must be for you to observe all these birds during the winter time. Terrific photographs, as always, Jim! Great images! 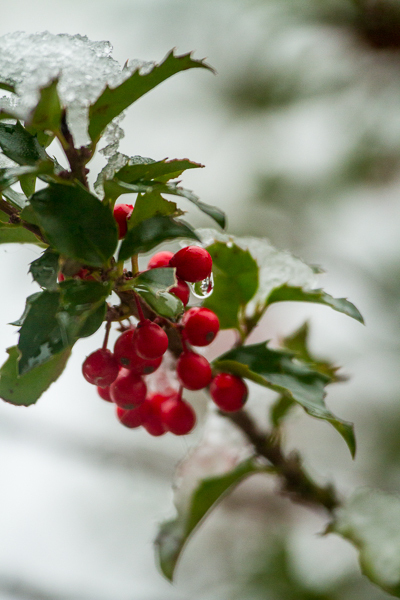 You might want to add some of the native hollies like Ilex verticilatta. These are deciduous and can be very heavy in berries. Much easier to spot the bird without all the leaves of everygreen hollies.